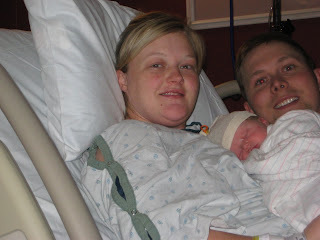 On Wednesday October 21, 2009 at 7:25, Cami Joanne Maroney joined our family!! What an experience that was. This time I had my husband there to enjoy the experience with, and I'm sure it was a new thing for him too!! But it was such a great time, I only wish Grant could have come into the hospital to meet his little sister :(, but he has been in love with her since we've been home, so I couldn't ask for anything more. Mark is not asleep in this picture... He just happened to be blinking. But I love the picture any ways. 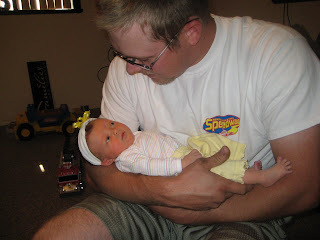 Cami weighed 7 pounds 7.5 ounces and was 19 3/4 inches long! Everyone thought she would be a good 8 pounder, but she surprised us!! She survived her 1st night at home!! Like I said, Grant is so in love with her. He always wants to hold and kiss her. 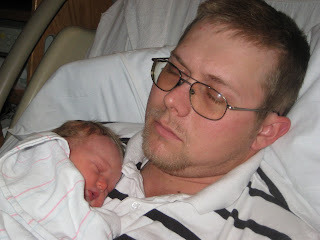 Every morning our family cuddles, and this is a tradition that we still try to do, even if we have a newborn!! I feel really bad because I don't have any pictures with Grant and Cami. It is very hard to capture a busy 2 year old kissing his little sister!! Next post I will be sure to get something!! I just wanted to get some pictures on for a long distance sister-in-law, and to let her know I was thinking of her!!! Congrats! She is beautiful (love all the hair!)! Enjoy every moment of her--the newborn time is so fleeting. So adorable! 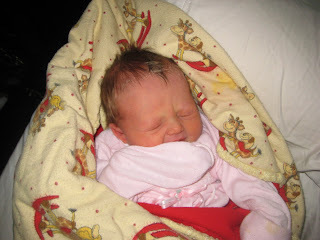 I so wish I was there to hold her and kiss her!! Congratulations on a healthy baby! Wish we lived closer, so Grant and Mason could play all the time!! Sounds like you are just so happy, and that makes me happy! You deserve all the happiness in the world!! Oh Rachel, she is so beautiful. I want a girl so bad...hehehe, but I love my boys. I havent heard much but I am guessing everything went well since you are at home now. I am going to miss you guys so much this Christmas. What a beautiful baby, Rachel and Mark. Congratulations! New babies are so wonderful! She is so adorable! I can't wait to meet her sometime... Hopefully sooner rather than later! Of course I checked your blog everyday except for yesterday, when you actually posted something. I love Cami already and can't wait to meet her. 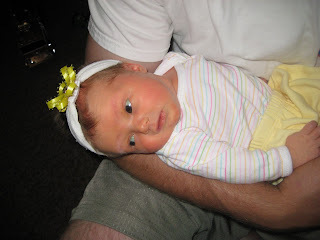 She is SO cute and I usually am not a fan of newborns.